Thailand’s capital, Bangkok, has two major airports: the newer Suwarnabhumi International Airport and the older Don Muang Airport. Don Muang Airport used to be the only Bangkok Airport until the new Suwarnabhumi Airport opened in 2006. Nearly all international airlines, including flights from Europe and the US, land at Suwarnabhumi Airport, while Don Muang Airport is used by all low-cost airlines from the region, such as Air Asia, Thai Lion Air or Nok Air. If one has a connecting flight with one of these budget carriers, after landing with an overseas flight at Suwarnabhumi Airport, you will inevitably have to plan the transfer time between both airports. For the transfer you should calculate about an hour, bearing in mind that these buses run every hour. There is a free shuttle bus, a public bus route and taxis available for transfer between the two airports. 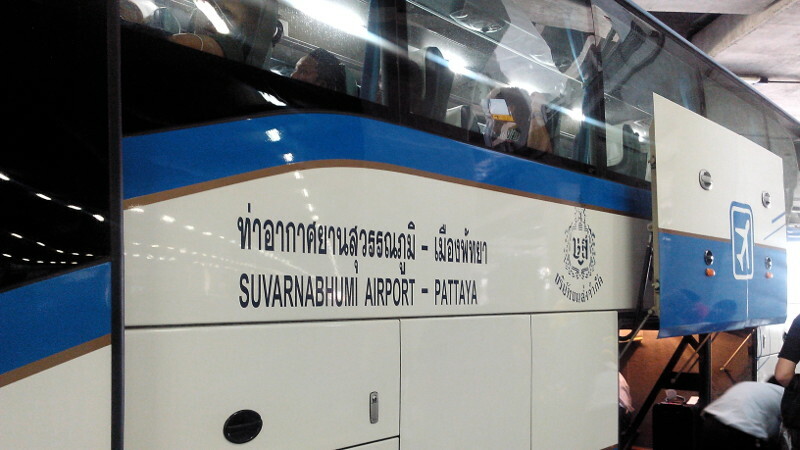 Passengers who want to travel to Pattaya or Hua Hin after arriving at Bangkok Airport can take a taxi (about 2000 Baht) or the Bangkok Airport – Pattaya Bus (134 – 250 baht) from Suwarnabhumi Airport. To get to the bus station at Bangkok airport, you have to go down to the basement of the airport, which is just another floor lower than the arrival hall. On the upper floor is the large departure hall (Departure Area) where the check in desks are located. One floor down, at an intermediate level, are numerous restaurants, small supermarkets and various shops and if you go down another floor, you arrive in the arrival area. At the very bottom, another floor below the arrivals hall, there is the bus station, from where not only the buses to Pattaya leave, but also the tour buses for package travelers to Bangkok and the surrounding area.